I absolutely do not like choices…. Especially like choosing my meal from a restaurant menu. I had to do that last night. My husband had a much overdue date night, I can’t remember the last one we had. Oh my! No children, although I love mine dearly like the rest of you, but just the two of us and I get to eat a dinner that is not cold. Here’s the kicker I love food so it is hard for me to choose when I want it all. Then I had to decide what was I going to wear. Well this is another story in itself. When I woke up yesterday I chose to embrace another day of my little man getting over a lingering sickness all weekend. However, it didn’t take me long to remember we had a date night.After being in the house since Thursday I didn’t have to choose to be excited! Isn’t life like that? Some things are so exciting in life like a vacation, a day filled with laughter, dancing to your favorite music hoping no one sees you, a date night, either way there isn’t a choice here. 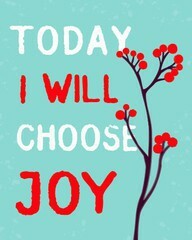 But then there are times you have to choose to be happy, excited, lovable, caring, obedient. Those times can be hard. I must admit sometimes it has been hard to choose these ways. But then I am flooded with God’s GRACE that he chose me and you! He chose to create me, he chose me for a purpose, he chose me to love him back. Because of God’s love for me I do not have to question my choice to Love God. It is not a choice. I love God. I do choose to obey, deepen my relationship with God, and share my faith though. He desires your love as much as we desire to be loved. So let’s choose to put God first in each and every choice. We make choices everyday. Today let’s choose to obey God, love like crazy, and get all GIDDY about life! I was looking through some of your content on this site and I believe this web site is really informative! Keep posting.